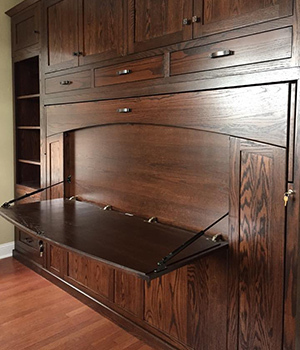 Murphy Beds and More, Amish Crafted Murphy Beds, Lancaster Handcraft, LLC. 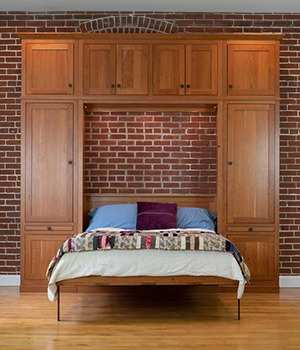 Our Murphy Beds are constructed by Amish craftsmen from solid oak, maple, or cherry in Traditional, Mission, or Contemporary styles. Side Cabinetry can be added to complete your built-in look and add storage. 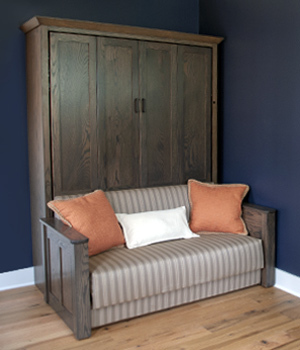 Murphy Bed Sofas are perfect for small apartments, condos, vacation homes, etc. You can enjoy a living room by day and a comfortable bed at night. We offer 2 styles of Murphy Bed Desks that allow you to add a bedroom and create a workstation at the same time. This dual function furniture is a smart, space-saving solution for home offices. Build your own unique configuration, using our Builder Tool. This tool will guide you through all the steps in order to complete your room design. "High praise for Lancaster Handcraft! We ordered a Murphy bed and side cabinet in oak for a guest bedroom. The bed was installed three days ago and we couldn't be happier. The bed is just gorgeous, very well made, and functions flawlessly." We are a small furniture business based in Lancaster County, PA. We work directly with Amish artisans who have been making furniture for several generations. The designs may have changed but the quality has not. All of our furniture is constructed from solid oak, maple, or cherry woods with other wood species available upon request. We use the finest hardware and a durable finish to ensure that your furniture will last a lifetime. 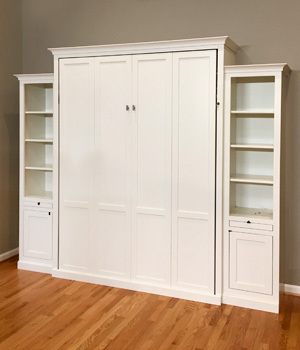 Each Murphy Bed can be customized with matching side cabinetry to fit your needs. You can select one of our many standard designs or we can help you design the perfect solution that would enhance your life and look beautiful in your home. To see our furniture, visit our showroom.